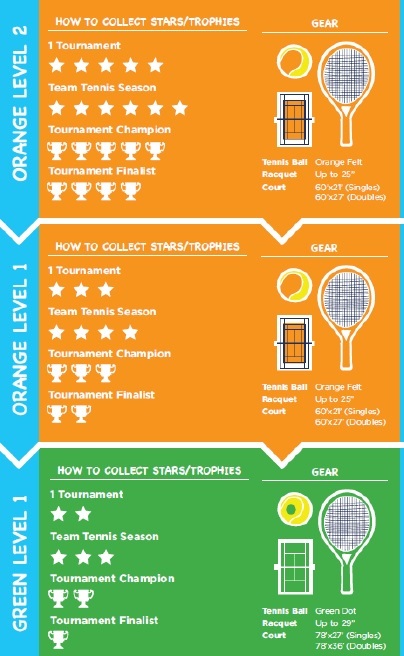 Youth Tennis Progression for 10U players! 1. Starting January 1, 2017, all 10U players currently in the tournament rankings or entering tournaments for the first time will be placed in 1 of 3 10U levels: Green 1, Orange 1, or Orange 2. The color is corresponding to the color of ball the player is advised to play in tournaments. Players currently in the tournament system will be notified in October which level they will be placed in starting in 2017. 2. Tournaments will be "tagged" with one of the three levels. Players in that level or 1 level above will be the only ones allowed to enter that division. 3. 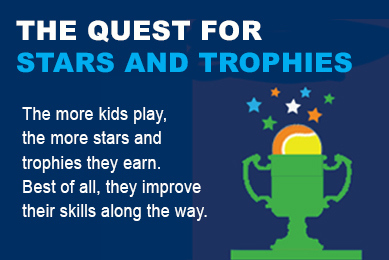 Players will earn STARS for participation and TROPHIES for success in tournaments. Players will earn advancement from one level to the next by a combination of these stars and trophies. 4. Only players 7 and older will be included in this system. Once a player turns 11, they will be removed from the pathway. GREEN 1: The top level. Designed for very experienced and skilled 10U players. Normally will be the smallest total group of players. With some exceptions, normally kids will not reach this level until age 10. GREEN LEVEL 1 PLAYERS CAN PLAY IN THE FOLLOWING DIVISIONS: 12U GREEN, 10U GREEN LEVEL 1, 10U ORANGE LEVEL 1. *USTA Kentucky will oversee all YPP tournaments in the state in 2017. If questions or concerns arise, contact Competition Manager Bryan Hash at 502-491-1290 or bhash@ustaky.com.